Register today for our annual Seven Star Retreat! This is a great opportunity to reflect upon your training, deepen your knowledge of the art, and get to know your fellow students. All belt levels are welcome and encouraged to attend. The retreat cost is on a sliding scale from $110-$130. The registration cost covers one night of cabin accommodations and three meals. Scholarship is available on a sliding scale from $50-$80 or pay what you can. Fill out the scholarship form to receive scholarship. There is also a small cost associated with transportation to the retreat. The Vashon Ferry costs approximately $20 for a car and 1 driver, with an additional $6/passenger. Please plan to split costs with the driver if you are carpooling. We will send around a carpool coordinating link in mid- to late-May to everyone registered for the retreat. Classes begin at 10 a.m. on Saturday, June 1st and end Sunday, June 2nd at noon. Teacher training for all teachers and assistant teachers is on Sunday from noon-3 p.m. There will be a few planned breaks and social time on Saturday evening, but most of the weekend is scheduled for training and training related activities. We encourage you to go to all classes, but please take care of yourself — it’s fine to take a break, nap, go for a walk, etc instead of taking a class. Camp Burton is a lovely location with waterfront access and hiking trails. If you have not attended one of our training retreats and are wondering what it's like, ask around before or after class to get insights from students who have attended one of the previous retreats. To get to Camp Burton: Take the Fauntleroy/Vashon Ferry. You must take either the 7:35 or 8:30am ferry from Fauntleroy (in West Seattle) to Vashon. You will be late to the first class if you take the 9:15am ferry. Camp Burton’s address: 9326 SW Bayview Drive, Vashon Island, Washington 98070 (approx. 20 min drive from Vashon Island Ferry dock). Park in the parking lot adjacent to Grisham Hall. The check-in registration table will be open from 9-9:45am in front of Grisham Hall. Departure to Seattle: Sunday afternoon ferries depart Vashon at 12:40pm, 1:15pm, 1:30pm, 1:50pm, 2:30pm, 2:45pm, 3:30pm, 3:50pm, 4:10pm, 4:45pm, 5:10pm. Bedding/personal items: Sleeping bag or twin-sized bedding, pillow, towel, toiletries, ear plugs, flashlight, hat or visor, sunglasses, and sunscreen. Gear: training clothes, your belt, sparring gear, mouth guard, shoes for training outside. Food & Water: water bottle, snacks, food (especially if you have special dietary needs). Seven Star will provide healthy snacks in Grisham Hall throughout the retreat. Weapons: arnis canes and nunchucks (note: we will bring Seven Star’s weapons if you do not own any). Misc: Training journal and pen. Fun stuff: Swimsuit, water shoes, beach towel, board games, puzzles, coloring books, acoustic instruments for playing by the fire, etc. 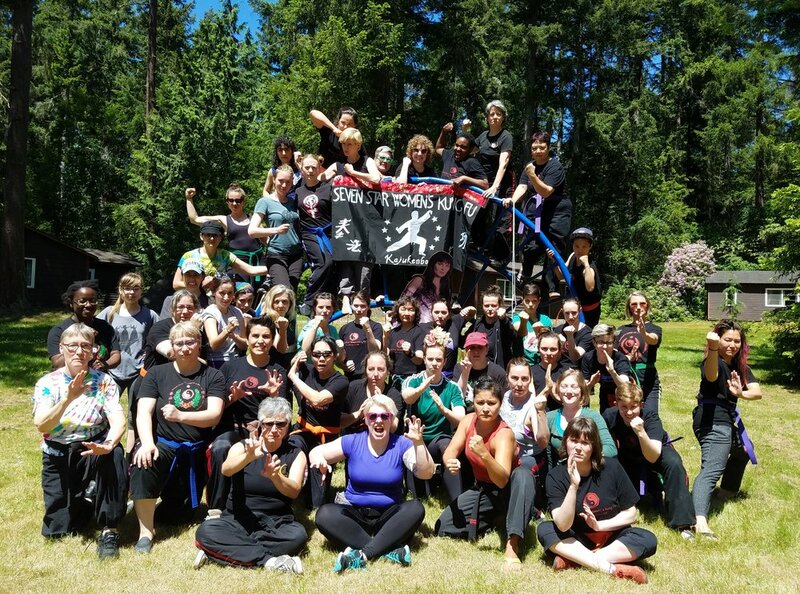 Contact: Caitlin Palo, Retreat Coordinator, caitlinpalo@gmail.com or Gina Mares Kurtz, Executive Director, gina@sevenstarwomenskungfu.com.